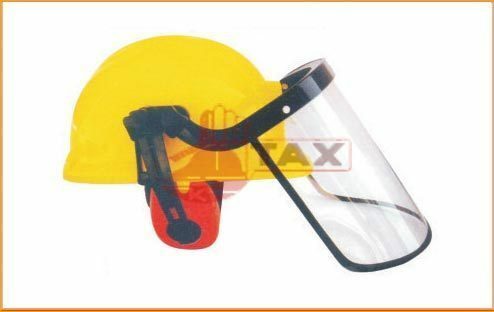 We offer safety helmet with grinding face shields which are used to get the protection. These face shield helmet, helmet with face shield provides complete protection to the face of an individual. This assortment of helmet with face shield is developed from high quality material and we offer it at a very nominal price. Acclaimed for the manufacturing, trading and supplying this admirable assemblage of Industrial Safety Equipment, we "S. K. Enterprises, Mumbai" were established in the year of 2007. In our product series, we are offering superior quality Disposable Products, Face Protection and Body Protection for our distinguished customers. These products are made in adherence with the set industry standards using the premium quality basic material. These products are highly praised for its skin friendly, superior finishing, wear and tear proof and optimum quality. Moreover, with their availability in different specifications, we have been able to serve diverse needs of customers. We are supported by an high-level infrastructure unit and highly productive workforce. We have state-of-the-art tools to produce the advanced products with strict acquiescence with advanced norms. We consider only supreme quality basic material to draw the offered array of products. To maintain all the company related process, we have a crew of well experienced and able professionals which work carefully towards their assigned tasks. Our experts are working in full coordination with each other and also with our customers. We provide quintessential pieces of instruction to our employees for heightening their skills and expertise with the progressive industrial developments. We are offering these products at the nominal market price for our customers.